The NBA regular season wraps up this week, as the Cavs prepare for their first playoff appearance since 2010. The Cavaliers will finish the season with a homestand against the Detroit Pistons on Monday and the Washington Wizards on Wednesday. The Cavs officially clinched the Central Division and the two seed in the East this past Wednesday. Like many experts, I believe that Cavs will win the East and advance to the NBA Finals for the second time in franchise history. Let’s take a look at the road the Cavs will have to travel to achieve the ultimate goal of winning a NBA Title. Three days remain in the regular season and the Cavs are still unaware of who their first round opponent will be. Four teams are still alive for the final two spots in the East. It appears that the Celtics will be the seventh seed after they won back-to-back games this weekend over a resting Cavs squad. 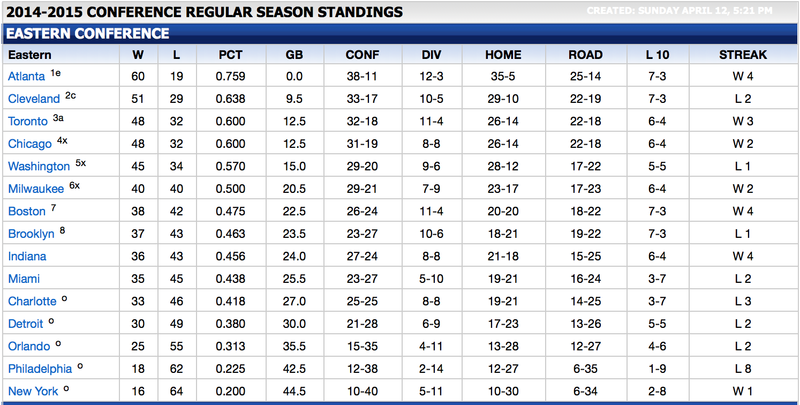 It is possible that the Brooklyn Nets or Indiana Pacers could jump into the seven spot, but I think Boston will hold on. The Celtics are the more desirable opponent for the Cavs in the first round. The Cavs easily could have swept the Celtics in the regular season, but wisely chose to rest LeBron James, Kyrie Irving, Kevin Love, and J.R. Smith. The Cavs have a clear advantage and will make short work of the Celtics in 4 to 5 games. The second round will provide a more intriguing matchup for the Cavaliers. The Cavs would play the winner of the Toronto-Milwaukee series. The Cavs won the season series over the Raptors 3-1. A Cavs-Raptors series would display some great one on one matchups. Cleveland’s Timofey Mozgov would face Toronto’s Jonas Valanciunas in a battle of bigs. Another fun matchup would be Kyrie Irving versus Toronto’s Kyle Lowry. I could see this series going 5 to games 6 with the Cavs winning due to the play of the big three. Even though, Toronto has an advantage over Milwaukee, don’t count out this Bucks squad. Milwaukee has a talented young team that could give the Raptors a tough time. If the Bucks shock the Raptors, I think the Cavs would easily win the series. Milwaukee lacks playoff experience, while the Cavaliers have plenty of it. The Eastern Conference Finals will obviously be the toughest challenge for the Cavs. I expect a Hawks-Bulls matchup in the Conference Semifinals. I would rather see the Cavs play the Bulls because of their longtime rivalry. However, I think the Hawks are more likely to advance to the Conference Finals. Regardless of which team advances, I can see the Cavaliers going six to seven games with either of these teams. Chicago can be a very dangerous team, but their biggest problem is staying healthy. Derrick Rose just returned this past week after a successful surgery that repaired a medial meniscus tear in his right knee. Joakim Noah and Jimmy Butler both missed some games due to injury. The Cavs won the season series against the Bulls 3-1. In all four games, the Bulls were missing one of their three stars. A Chicago team at full strength would give the Cavs a good series, but I think the Cavs would still come out on top. The Cavaliers dropped the season series to the Hawks 3-1. Some people would find this concerning, but the first three games came before the trades for Mozgov, Smith, and Iman Shumpert. LeBron James also sat out the third game, which is another reason why Cleveland struggled. The Cavs improved in the final meeting with Atlanta, but still lost the game 106-97. At the time of that March 6 meeting, David Blatt was still tweaking his bench and defensive sets. The Cavs have been on a roll since then and have a won a NBA best 32 of 41 since mid-January. The Hawks play as one team which is key, but they lack star power and a good bench rotation. The Cavs have plenty of star power and a bench that is deep with playoff experience. My bold prediction is that the Cavaliers will win the Eastern Conference and will play for a chance to bring Cleveland it’s first professional sports championship since 1964.